The new Greensmaster® 3150 is the quietest engine-powered riding greens mower in the industry. This is a tremendous achievement in reducing noise for bystanders on and near the golf course, along with the operator. The Greensmaster® 3150 provides full operator control and superior convenience. The hydrostatic drive system includes dynamic braking, which eliminates speeding up on downslopes. The joystick control panel is connected to the seat base, so the controls maintain their position for the operator and the seat slides to compensate for the varied height and size of the operators. The open steering arm allows right or left exit, with tilt adjustment and is adjustable at the base for larger operators. Additional features include 3 wheel drive and ROPS and a storage compartment for raingear or radio. The Greensmaster® 3150 is THE QUIETEST engine-powered riding greens mower on the market. The new muffler absorbs more close and long-range sounds than ever before. All components, especially those that require daily inspection and routine maintenance, are conveniently located for servicing. 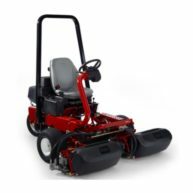 Toro riding greens mowers have fewer hydraulic lines and connectors are engineered for easy visual inspection for leakage on all hydraulic components. The placement of the centre cutting unit, located between the the front traction wheels, along with the front centre basket removal, allows a low mounting design of the transmission and engine. This lowers the centre of gravity, giving the machine much higher hillside stability. Eliminate tipping forces in turns, especially advantageous on perimeter cuts and where cutting unit slides rather than tips. Therefore, no pressure is exerted on the inside of the cutting unit which avoids turf stress.